Father Divine, religious founder of the International Peace Missions Movement, businessman, and civil rights activist was born George Baker in Rockville, Maryland to George and Nancy Baker. Viewed by many to be a cult leader, his doctrine was a compilation of optimistic thinking based on many widely accepted mainstream religions. 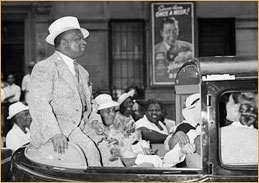 Father Divine and his followers believed that he was the second coming of Christ. He required his followers to adhere to his International Modest Code which required strict commitment to a celibate lifestyle and abstinence from immoral actions. Father Divine began receiving widespread public attention when in 1919, he and his first wife and several of his interracial religious followers moved to Sayville, New York and established a Peace Mission “heaven.” Peace Missions heavens were interracial communal living facilities that fostered Father Divine’s belief in a desegregated society and represented heaven on earth to his followers. In the 1930s Divine’s network of Peace Missions spread across the nation. His mostly white followers in Los Angeles, California and other west coast cities contrasted with the overwhelmingly black missions east of the Mississippi River. Around 1930 Father Divine moved his Peace Mission headquarters to Harlem, New York. Since the late 1940s the organization has been based out of Philadelphia, Pennsylvania. Father Divine’s Depression Era message of racial equality and economic self-sufficiency drew blacks and whites into his following. Under his leadership, the International Peace Missions Movement promoted desegregation and coordinated anti-lynching protests. Over 150 Peace Missions were launched nationwide and abroad creating living facilities and jobs for the poor. As a result of Father Divine’s business acumen, the organization established various businesses and entrepreneurial enterprises that provided high quality yet inexpensive goods and services to patrons. At the end of the Depression Era, it was estimated that Father Divine and the Peace Missions Movement had amassed $15 million in assets including a small island in the San Juan Islands between Bellingham, Washington and Victoria, British Columbia, Canada. Following his death in 1965, Edna Rose Ritchings, Father Divine’s second wife known as Sweet Angel by Peace Missions followers, continued his legacy of promoting racial equality, self-sufficiency, and adherence to a chaste moral lifestyle. Jill Watts, God, Harlem U.S.A.: The Father Divine Story (Berkeley: University of California Press, 1992); Robert Wiesbrot, Father Divine and the Struggle for Racial Equality (Urbana: University of Illinois Press, 1983).